Pom Coong Village is situated in Mai Chau town, Mai Chau district, prompting the tourists' curiosity right from its name. Here, Thai people have known how to promote the tourism industry right from their daily life. 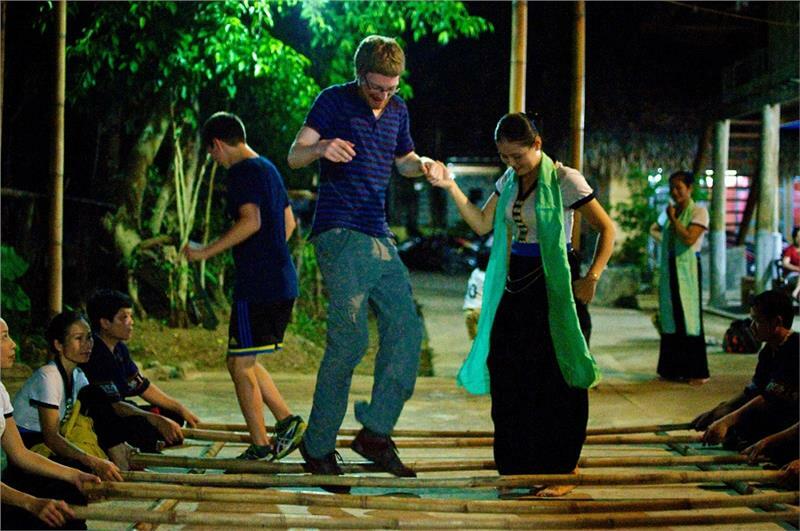 From the stilt-houses, the daily activities to the beauty of cultural life has established and developed the tourism. A journey to Pom Coong Village actually offers a great opportunity to explore the outstanding nature beauty and culture richness of Mai Chau, the gateway to the impressive Northwestern area of Vietnam. Mai Chau travel to the village provides both physical activity and the unique chance to observe a way of life that has changed little over the centuries. Together with Lac Village, Pom Coong Village gradually becomes the appealing tourist attraction in Mai Chau in particular and Hoa Binh tourism in general. Like other villages of the Muong ethnic minority groups, Thai people in Pom Coong Village often concentrate in hilly areas where there are both rivers and streams. Their houses are especially leaned back the mountains and overlook to the ever-stretching rice fields in front. In addition, Thai ethnic group has long been famous for "xoe" dancing (a traditional dancing in Thai ethnic minority) and bamboo dancing. "Xoe" dancing is a kind of famous, intimate and simply dancing performance. It is one of typical characteristics of the Thai people which today has been stored and preserved. Moreover, unlike stilt-houses in other ethnic minority, the stilt-houses of Thai people are usually taller. It thus always creates clean feeling and fairly airy space. The floor is around 2m above the ground supported by extremely strong wooden pillars. The floors are usually made from the bamboo or buong. The roof is thatched or covered by rattan leaves or bricks. The windows in the house retain fairly large for welcoming the cool breezes; simultaneously, it is home to hang orchid, forest flowers, or the bird cages. At the foot of the stilt-houses, Thai girls passionately ply with the looms to make up unique brocade products, attracting the large number of curious tourists. The souvenir products including brightly colorful brocade sheets, bags, or shirts on sale right at the foot of the stilt-houses make the whole houses in Pom Coong much more prominent. In particular, the most appealing impression in Pom Coong Village is the extremely fresh "pure Thai" space. The clean water and sanitation are regulated to offer tourists the feeling of freshness and safety. Water resource is mainly used the tap water respectively hygienic. The refuse is classified, put into containers and will be processed. All of the roads and alleys in the village are clean and no littering situation. Here, tourists will feel the freshness of earth and heaven, the peaceful life, and will actually forget tiredness and worries in the hustling and bustling urban life. Tourists also have a chance to meet lovely Thai girls in their traditional dances or encounter them in the tenderness and diligence in daily life. Setting foot in Pom Coong, tourists not only enjoy tranquil and peaceful natural surroundings, immerse in the wonderful nature, but also ascertain about the unique cultures of ethnic minorities. Go to Pom Coong in particular and Mai Chau Hoa Binh in general to better understand about the life and Thai ethnic people. Tourists will have the opportunity to immerse themselves in the life of Thai people, admire "xoe" dancing, the gong festivals, "can" wine (a kind of traditional wine in ethnic minorities and drunk out of a jar through pipes), experience to overnight in stilt-houses, and contemplate the stretching endless mountains and stunning scenery here. It is the moment that tourists actually cannot forget the beautiful image of Pom Coong Village as well as the Thai people in Mai Chau. 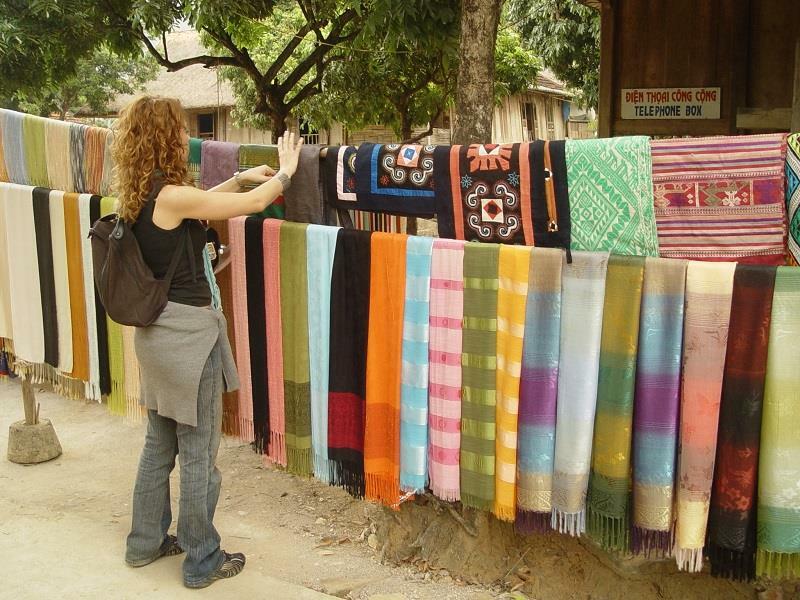 The village is worthy appealing spot not to be missed in any Mai Chau tours. Go to the Pom Coong Village to mingle in the tranquil nature and the friendly locals, temporarily forget the worries and the chaos of humming urban life.